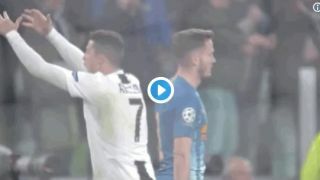 Cristiano Ronaldo seems to have stolen Diego Simeone’s weird celebration after Juventus beat Atletico Madrid 3-0 tonight. The Italian giants were beaten 2-0 in the first leg of this Champions League tie, prompting Simeone to do this in celebration. Well, as you can see in the video clip above, tonight Ronaldo had the last laugh and decided to do the same. The Portugal international was sensational again in the Champions League tonight, scoring a hat trick to see Juve through to the quarter-finals.